fitting ​ that the format needed to include its younger age groups. 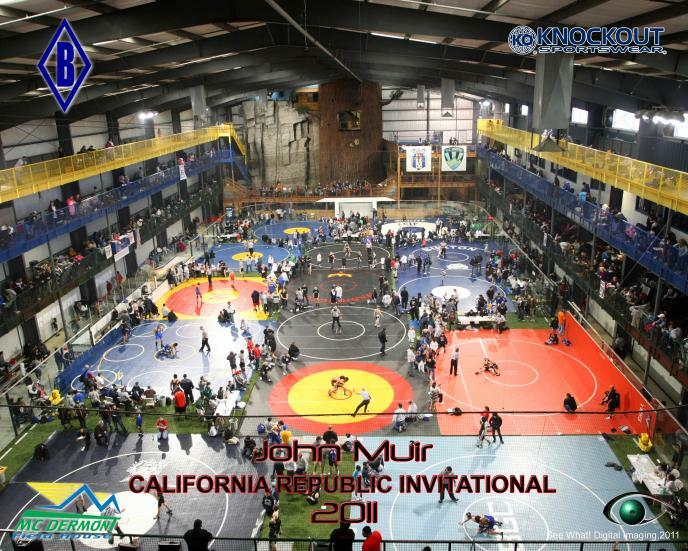 It was at this point that the John Muir Invitational would adopt a multiple divisions format seen at the State and National level... thus a 6 & under, 8 & under, 11& under, and Jr. High divisions were adopted. Event coordinators now realized that with the growth of the event in Jr. High competition along with the foreseen participation of the younger divisions, the host location for 19 years would no longer suit the growth of the event any longer. After months of research and deliberation, the newly formed California Republic Invitational found Mcdermont Fieldhouse as the host location. With enough room to lay down 14 mats, Mcdermont had more than enough space to satisfy the growth of the event and inclusion of multiple divisions in year one... In year 2., we used the 2nd field on the 3rd floor to lay down 4 more mats giving us 17 total. Year 3 can accomodate even more growth by including more mats (4 more on top floor) or up to 10 more in the south section of the facility. 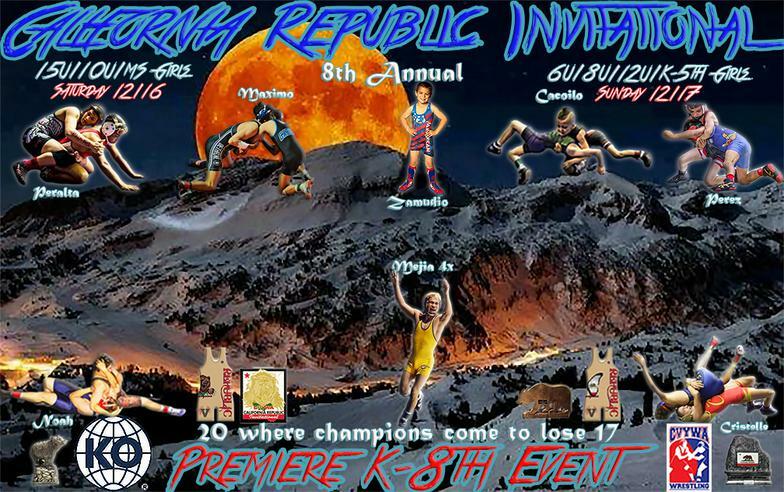 Sky is the limit for this event as we discuss the possibility of adding a High School division... a High School Girls Division... and a Youth Girls Division in the near future. ​With over 650 participants the 1st year and over 710 participants the 2nd year, and 730 in its 3rd year, CRI has proved to be a monster event for California. Brackets have been deep with talent from every part of California and Nevada. 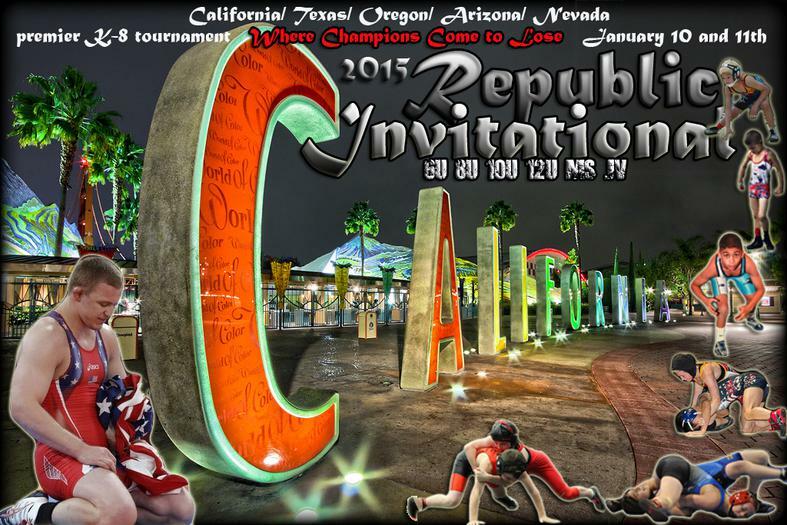 With 53 weight classes in 4 age divisions on 17+ mats, CRI is THE measuring stick for what will happen at SCWAY/USA state in March. Some weight classes have been so deep with talent that many previous State and National placers failed to get on the podium at this event. Thus the motto, "CRI... Where Champions Come to Lose!" is accepted as truth. In its 4th and 5th years , CRI attraced a stronger following than the previous years. 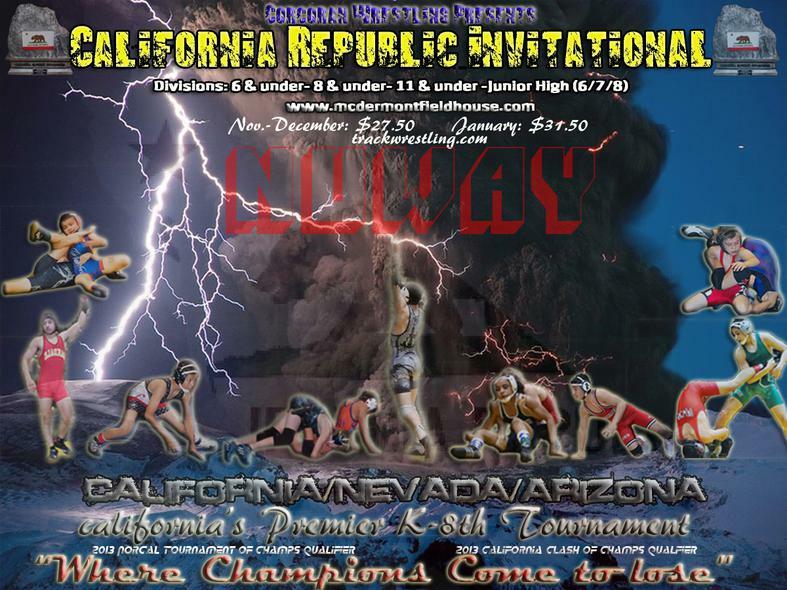 The who's who of youth wrestling continued to flock to this event adding wrestlers from Arizona,Oregon, and Texas to the already strong Nevada and California following. 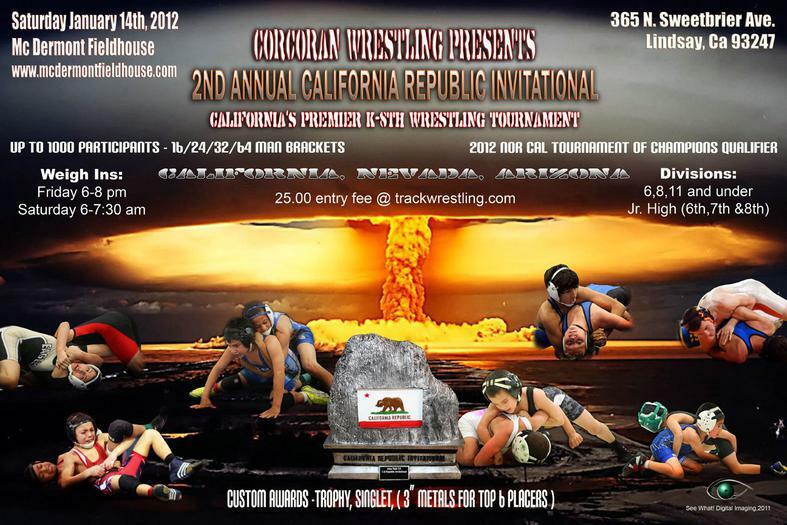 The competition was undoubtedly as tough as ever with over 750 participating wrestlers. 9th version will showcase as large a following than years past. 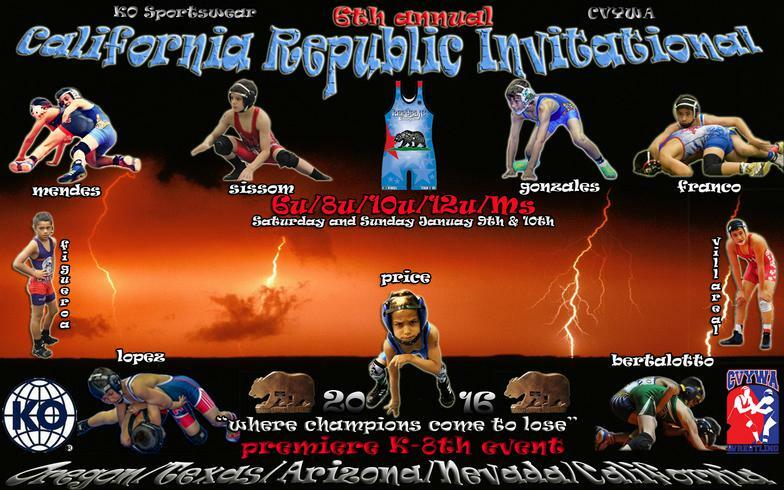 The event continues to give the California wrestling community exactly what they want.... one of the toughest events in the Western States right here in our own back yard. Other states are noticing and following suit by traveling from afar and attending this monster Cali event. 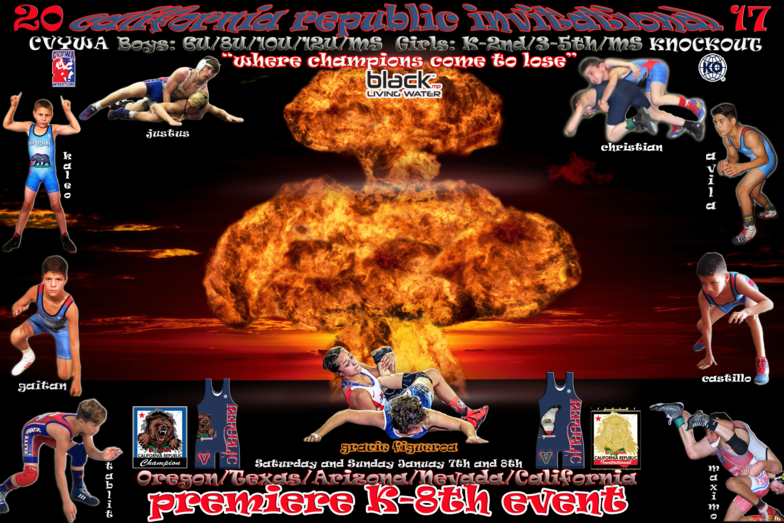 In 2017, we will change it up a bit running MS/10U/MS Girls on Day Saturday while running 6/8/12/K-2nd Girls/3-5th Girls on Sunday, giving many of the kids an option of wrestling 2 different divisions on seprate days. Our ability to go your in and out with the amount of wrestlers we attract is a strongsuit not many events can claim. Each year, we do what we can to make you come back for more. 2018 will be no different.